Kevin Smith has decided to take a 1970's era Hockey tale to Warner Brothers for first dibs. Smith confirmed this via Twitter by saying, "Hey @MitchAlbom! Headed to WB for official HIT SOMEBODY pitch! Roll by the Joe & give it a rub for good luck. Big Thx. The Cup Run begins…" If Mr. Smith gets his way, "Hit Somebody" will be his next film. Don't expect 'Somebody' to be an all out comedy either, Smith has explained it is much more a personal drama based off Warren Zevon's song of the same name. Smith does reveal the film will still have a comedic vein, but that is the first film Smith believes could garnish award attention. He said, "I never once thought about winning awards or anything, but that movie I think can do it. If I play my cards right and we get the right people in it, it could be an award-type movie." If WB does not bite at "Hit Somebody," Smith will continue to shop the script to other studios in hopes of getting the project in front of cameras that he is really confident in. 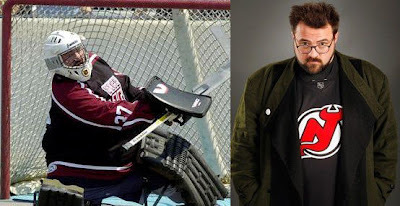 I really hope Smith does in fact get the Hockey film made, because I'd really like to see Kevin Smith back on top and know he has it in him.